Fermentation is simply the process of converting a carbohydrate or sugar to alcohol or acid. Many cuisines all over the world have fermented dishes such as South Korea’s kimchi, Indonesia’s tempeh, Russia’s kefir, South India’s dosas, and Germany’s sauerkraut. Not to be outdone, the Ancient Chinese are believed to be the first to ferment an alcoholic beverage sometime in 7000-6600 BC. Fermented food is packed with nutritional value, including vitamins and minerals, good bacteria, and live enzymes. Lactic acid fermentation refers to a biological process whereby glucose and other six-carbon sugars are converted into the metabolite lactate and into cellular energy. Six-carbon sugars include sugars such as lactose and sucrose. Lactic acid fermentation is an anaerobic fermentation reaction occurring in some bacteria and some animal cells, including the cells of the muscles. Lactic acid bacteria are important when it comes to producing and preserving wholesome foods. Lactic acid fermentation is generally inexpensive, and it often requires no heat in its preparation, which means they are also fuel-efficient. If foods are fermented with lactic acid, they play a vital role in feeding the population of the world, from continent to continent. Both lactic acid fermentation and brining are popular for processing and preserving vegetables because they are inexpensive and have low energy requirements for both functions, and they result in many versatile flavors. The salt concentration can affect the course of the fermentation, which in turn affects the softening and prevents putrefaction. There are other advantages, of course, including making foods resistant to spoilage and the development of toxins. Lactic acid fermentation can also modify the original ingredients’ flavors and even improve the nutritional value of the foods. When it comes to providing inexpensive and nutritious foods to the hungry people of the world, one of the best methods of food preservation and processing is the lactic acid fermentation process, and this goes for all foods, including milk-cereal mixtures and even fresh vegetables. The equation for lactic acid fermentation looks like this: pyruvic acid + NADH –→ lactic acid + NAD+. Essentially, lactic acid fermentation is a series of chemical reactions that are anaerobic in nature and which NADH is used by pyruvic acid to form the lactic acid and NAD+. Afterward, this is used in glycolysis. A good example of the process is the soreness you feel after you play a hard game of basketball or football. Lactic acid builds up in the muscles as you exercise, which is why you feel the soreness. Put another way, in this process glucose, sucrose, and fructose convert into cellular energy and into lactate, which is a metabolite. When it comes to lactic acid fermentation, even your muscle cells can be affected. In the fermentation process, the production of ATP is minus oxygen, as the process is done only through glycolysis. Glycolysis breaks down a glucose molecule into two pyruvate molecules, and this results in a net gain of two NADH molecules and two ATP. When you work your muscles too hard, the buildup of lactic acid causes pain and sometimes inflammation. When you work out, your cardiovascular and respiratory systems are unable to transport oxygen to your muscle cells, especially the muscle cells in your legs, quickly enough to maintain aerobic respiration. Because it must allow continuous production of some ATP, this is when your muscle cells use the lactic acid fermentation process. Alcohol fermentation is also called ethanol fermentation, and it refers to a biological process that converts sugars such as fructose, sucrose, and glucose into cellular energy. It produces carbon dioxide and ethanol as a side effect. The process is considered an anaerobic process because yeasts perform this conversion without oxygen. If you love beer or wine, you are appreciative of the alcohol fermentation process even if you didn’t know it. Yeast is a eukaryotic microorganism which metabolizes sugars anaerobically via a pathway called alcohol fermentation. During this process, simple sugars are converted into carbon dioxide and ethanol. Yeasts usually function under aerobic conditions but can also function anaerobically. When there is no oxygen available, alcohol fermentation occurs in the yeast cells’ cytosol. In alcohol fermentation, yeast starts with glucose, which is a kind of sugar but ends with ethanol and carbon dioxide. There are two basic parts of alcohol fermentation. The first part involves the yeast breaking down glucose in order to form two pyruvate molecules, a process known as glycolysis. The second part involves the two pyruvate molecules being converted into two ethanol molecules and two carbon dioxide molecules. Ethanol is another word for alcohol, and this second part is called fermentation. The main reason for alcohol fermentation is so that ATP, which is the energy currency for cells, is produced, and it is produced under anaerobic conditions. From the yeast’s perspective, therefore, the ethanol and carbon dioxide are waste products. One of the reasons alcohol fermentation is so important is that it provides energy when there is an insufficient amount of oxygen present. There is also an economic importance to the process, particularly in the production of items such as alcoholic beverages and bread. This fermentation process is the driving force of the baked good and beer industries, which means its importance is not likely to wane anytime soon. There are numerous differences between the two types of fermentation. In alcohol fermentation, the pyruvate is converted into ethanol and carbon dioxide. It can also be used to make beer and wine, as well as the ethanol that is used in gasoline. In lactic acid fermentation, the pyruvate converts into lactic acid instead of alcohol. In alcohol fermentation, the CO2 is split off, and the end product is a two-carbon compound called ethanol, whereas in lactic acid fermentation, the end product is actually a three-carbon compound known as lactic acid. In both processes, the end products are large organic compounds that store energy, but they are not oxidized further to release energy. Furthermore, both types of fermentation are anaerobic respiratory processes, and they produce two ATP each. The reducing agent is something called NAD+, which is regenerated in the process. However, lactic acid fermentation occurs only in animal tissue, whereas alcohol fermentation occurs only in plant tissue. They also differ in the energy efficiencies of the processes. Lactic acid fermentation has an efficiency rate of 41%, while alcohol fermentation has an efficiency rate of only 29%. Lactic acid fermentation and alcohol fermentation also result in different products and occur in different places. Fermentation always involves converting a sugar to either a gas, acid, or alcohol, and it is a common process among various life forms. In fact, the fermentation process is one of the most ancient and primitive metabolic mechanisms in existence. In lactic acid fermentation, the waste products are water and lactic acid, but with alcohol fermentation, the waste products are water, alcohol, and carbon dioxide. Both lactic acid and alcohol fermentation are processes that convert carbohydrate. Converting the carbohydrates into a type of alcohol can be seen in processes that include converting grapes into wine. Fermentation converts carbohydrates, or sugar, into gases, alcohol, or acids. This process occurs in bacteria and yeast, and the process can also describe the bulk growth of microorganisms on a growth medium. The latter is often in an attempt to produce a specific chemical product. Fermentation is a common practice in the processing of food. Many foods have been results of the fermentation process, including alcoholic beverages, leavened bread, yogurt, olives, and vinegar. Other fermented products can be seen in charts such as this. Amasake: Also called sake, it is a rice drink that is fermented and tastes very sweet; it originated in Japan but has become quite popular in the United States and other countries. Anaerobic: This simply describes environments that are without oxygen (aerobic = oxygen). When it comes to fermentation, it is necessary to have an anaerobic environment in order to break down the carbohydrates and turn them into sugar. Antibiotics: This term can refer to medications, antiseptics, or sterilizers that eliminate microbial life found in an environment. Apple Cider Vinegar (ACV): A very raw vinegar that is fermented from apple cider. According to many people, ACV is a great health tonic that can help with everything from having smoother hair to reducing arthritis pain. One quick trip to the Internet can result in learnings dozens of other uses. Bacteria: Bacteria are microbes. There are good and bad bacteria, and good bacteria are called probiotics and provide certain health benefits. Bad bacteria can harm your health; for example, bacteria such as salmonella and E. Coli. Brine: This is a saltwater solution that is used for fermenting and pickling, and it acts on the food because it draws the water from its cells and kills any bad bacteria that runs the risk of spoiling the food. Colony Forming Units (CFUs): Used mostly in microbiology, CFUs are units of measure used when reporting bacterial counts. Continuous Brew (CB): This is a term that usually refers to the traditional method of brewing Kombucha. In the process, the SCOBY is left alone in a container and the finished product is drained frequently, usually daily. Sweet tea is also added, usually in the same amount. For most people who brew Kombucha, this is the preferred method. Enzymes: Enzymes are proteins which mediate and facilitate the numerous chemical functions of the digestive process. Enzyme Inhibitor: This decreases the enzyme function, which can even interfere with a person’s digestive process. Fermentation: Fermentation refers to the transformation of foods metabolically via the various actions of microbial organisms. Fermento: This is a person who ferments food and is passionate about the process and even about live cultures! Flora: This is a general term that is used to describe the microbial life which is living within an organism. Fungi: Fungi are living organisms that are able to grow in a lacto-fermented environment. They do not, however, include animals, plants, and bacteria. Ginger Beer Plant (GBP): Ginger beer plant is a culture, in fact, another SCOBY, which is similar to the original way to make ginger beer. GRAS Status: An acronym for Generally Regarded as Safe, it is an FDA status that refers to fermented vegetables, which per the FDA have to carry this status. Gut: The gut is the gastrointestinal tract where food goes through the digestive process and where microflora live. Incubator: This refers to any supply or object that helps your fermented food stay at the desired temperature during the process of fermentation. Irradiation: This is a fairly new process of preserving food which uses pulsed electrical and high-pressure fields to kill the microbes found in food. Koji: This is a fermented starter that consists of rice and cultured soybeans. Koji breaks down the sugars and carbohydrates in various food products. Kombucha: This is a fermented drink used for healing that originated in Asia. It is made from SCOBY, sugar, and tea, and it has a taste that is a bit tangy. It can even taste a little vinegary, and it is known to make the person drinking it feels fantastic. Kvass: A fermented beverage that began in Russia as a brewed drink and is made with either beets or rye bread. Its taste is similar to cola or root beer. Lactic Acid: A type of acid that stops the growth of bad bacteria that can spoil your food. Lactic acid turns your food into fermented goods that are consumable and tasty. Lactobacillus: This is a bacteria that helps produce lactic acid from carbohydrates. It also turns starches into sugars and is very important in the fermentation process. It is also known as L. Plantarum, and the term “lacto” refers to a bacteria genus strain which infiltrates the fermentation of vegetables. Lacto Fermentation: A process whereby food is preserved via a specific environment that is characterized as saline (i.e., with salt) and anaerobic (i.e., without oxygen). The environment promotes the growth and creation of microbial life; in other words, good bacteria or probiotics. Microbes: Microbes are live microscopic bacterial organisms that colonize and live within and among organic matter, both on and in plants and animals. MicrobiomeThis refers to a colony of bacteria living in an organism that works symbiotically with the human body to balance bodily functions and regulate the digestive process. This is simply milk which has been fermented using milk kefir grains or another culture. The milk thickens and becomes like a drinkable yogurt, and it is very rich in probiotic bacteria. This is the actual culture that turns milk into kefir. It is a SCOBY and not an actual grain. Phytic Acid: These are anti-nutrients that occur naturally in some grains; they can prevent healthy minerals from absorbing into your body. Pickled: This term normally is used interchangeably with the term “fermented,” and it may also refer to vinegar and heat-canning methods because both of these can kill the live cultures in food. Post-Pasteurian: This can refer to either a mindset or a person advocating for fermentation and a scaling back of the current approach in “food safety,” which includes any of the mainstream, prevailing approaches. Probiotics: Similar to lactobacillus, these are microorganisms that are good for the human body, particularly the gut. They also occur naturally in foods. Raw: Raw food is food that has never been heated above 144 degrees Fahrenheit. SCOBY: SCOBY is an acronym for Symbiotic Colony of Bacteria and Yeast. In the making of products such as Kombucha, it is crucial. SCOBY is also an ancient fermented drink known for its healing properties. Generally only used when describing the Kombucha culture, SCOBY can also refer to items such as water kefir grains, vinegar mothers, milk kefir grains, and many other cultures. Starter: Another name for any product that is pre-fermented. You can purchase starter cultures commercially or make them at home. All starters include microorganisms that occur naturally, including Lactobacilli, as well as other food products that include flour and water or a dairy product like yogurt or milk. Water Kefir: A cultured beverage that is made out of sweetened liquid or a naturally sweet liquid. Sometimes made with a base of juice, other people make a solution out of sugar water then culture it, while still others use coconut water. Water Kefir Grains (WKG): Also called tibicos, sugar kefir grains, and a lot of other things, these are cultures used to ferment the sweet solution into a probiotic beverage. Water kefir grains convert the sugars which are present into CO2. Wort: When you homebrew a product, wort refers to the beverage or soda mix that exists before you add the starter and the initiated fermentation. Yeast: This is a specific type of fungi that is frequently found in foods that have been fermented. Contrary to what you might think, you likely already have a yen for fermented foods. If you eat and enjoy cheese, salami, yogurt, pickles or alcoholic beverages, you are consuming foods that have been fermented! 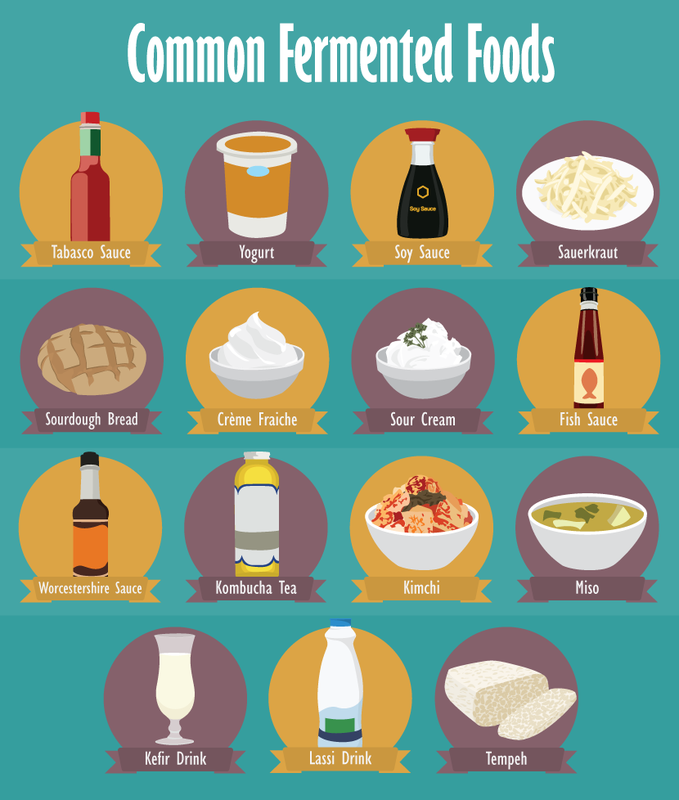 Other foods that you may like are also fermented, including miso, kimchi, and tempeh. Certain bacteria are actually good for you, and, based on published statistics, fermented foods have never caused illnesses. Only the good bacteria are used in the fermentation process, so the resulting foods are always safe to eat. In fact, some studies have shown that fermented vegetables (can anyone say sauerkraut?) are actually safer to eat than raw vegetables. It is common in parts of Asia and other parts of the world to ferment soybeans and soy-based foods. These include miso and some soy sauces, tempeh, and natto, which is a Japanese food that is fermented with soybeans and is very flavorful. In addition to being healthy, many fermented foods offer other benefits as well. Fermentation can preserve foods such as cheese, salami, yogurt, pickles, and kefir. Because fermentation is such a versatile process, nowadays almost any food can be fermented into something tasty. Fermented foods are actually healthy for you, in part because they all contain probiotics, yeast, or the “good” bacteria, all of which aid in the digestive process. The nutrients found in foods that have been fermented are also more bioavailable, which means the nutrients are absorbed more quickly and more efficiently. The nutrients are also predigested by the good bacteria during the fermentation process, which means they are more easily taken up by your own body. Any Food is Able to Be Fermented! Any animal or plant product making up the food system can be populated by bacteria, which allows the fermentation process to take place under the best conditions.